Governor Baker testified before the House Natural Resources Committee Wednesday. Baker urged the government to increase funding to build more resilient infrastructure, create federal emissions targets that could vary by region, invest in research related to emissions reduction and climate change adaptation, and to generally incorporate climate change risk into federal planning decisions. His remarks show a significant departure from the approach taken toward climate change by top Republicans, including President Trump, who has called climate change a “hoax,” disputed whether it is man-made, and pulled the United States out of the Paris Climate Accord. Just last week, Trump sent a tweet suggesting the historically cold weather then gripping the country was evidence that “global warming” has gone away. Baker’s testimony also shows how much he has evolved on the issue. In 2010, when he ran for governor unsuccessfully, he told a Globe reporter he wasn’t saying whether he believed in climate change because he didn’t know enough about it. He later said humans were contributing to climate change. He recently called for a new tax on real estate transfers to fund preparations for climate change. And on Wednesday, he drew on his experiences dealing with snowstorms, nor’easters, drought, and coastal erosion during his time in office to pressure the Trump administration to take more action. The hearing was one of two about climate change scheduled for Wednesday on Capitol Hill. The other was in the Energy and Commerce Committee subcommittee on environment and climate change, which had not held a climate change hearing in six years, according to The Hill, a political news publisher. Baker was asked by Democrats on the committee, which is chaired by Representative Raul M. Grijalva of Arizona, to appear with Governor Roy Cooper, a Democrat from North Carolina. “They want to pick apart administration policy,” said Doug Heye, a Republican strategist who previously served as a spokesman for Republicans. While Trump and other Republicans, including Senators Mitch McConnell of Kentucky and James Inhofe of Oklahoma, have expressed deep skepticism about climate change, more moderate Republicans have been willing to express concern about the problem. By the end of the last Congress, 45 Republicans were members of the “climate solutions caucus,” although just under half of them either retired or lost their seats in the midterm elections as the Democratic wave swept a number of moderate Republicans out of office. In his testimony, Baker cast climate change as a bipartisan issue that affects people’s homes and livelihoods and the regional economy. Grijalva, the chairman, asked the governors about the notion that it’s too late try to halt climate change — and that it would be too expensive. Baker said the state and federal governments need to work together to confront a problem already affecting many. “If you have farmers or fishermen or resort operators or foresters in your communities or in your districts, I promise you they are worrying about climate change all the time,” Baker said. He cited Massachusetts’ emissions goals, which require the state by 2050 to reduce carbon emissions at least 80 percent below 1990 levels. He also highlighted the Regional Greenhouse Gas Initiative, the state’s promotion of hydropower and offshore-wind energy, and the state’s “municipal vulnerability preparedness program,” which provides funding for local governments to adapt to climate change. Representative Tom McClintock, a California Republican, questioned Baker about criticism of wind turbines in Falmouth, which the Cape Cod town recently voted to remove amid fierce neighborhood opposition and multiple lawsuits. The governor acknowledged the Falmouth project might not have been carried out perfectly, specifically regarding where the turbines were placed. He said the experience should discourage future projects like it, however. Sara Chieffo of the League of Conservation Voters praised Baker for his willingness to testify. “I think it shows that when it comes to elected officials that are working at a more state and local level, that the partisanship we see about climate change at the federal level is just not the same,” Chieffo said. But other environmental advocates said they want Baker to go further. 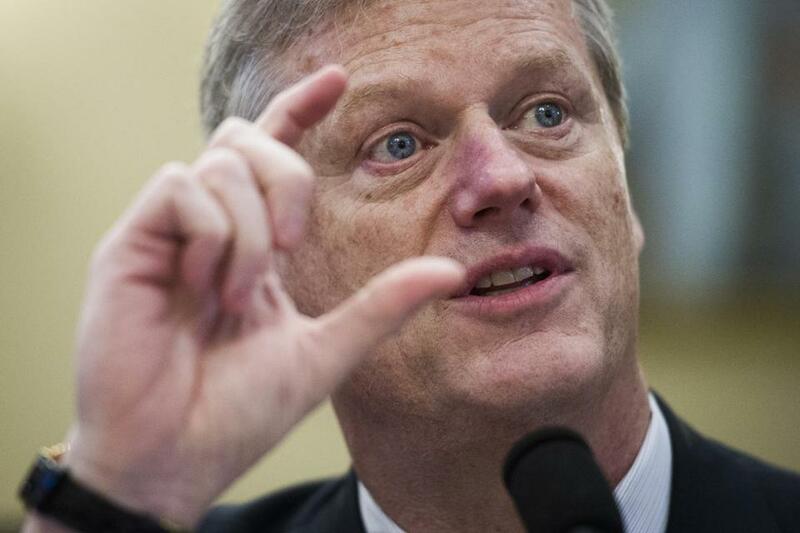 “We hope that Charlie Baker is calling for more ambitious emissions reductions targets and more equitable policies on the federal level than he has implemented in Massachusetts,” said Deb Pasternak of the Massachusetts Sierra Club. Correspondent Ysabelle Kempe contributed to this report. Jess Bidgood can be reached at Jess.Bidgood@globe.com. Follow her on Twitter @jessbidgood.